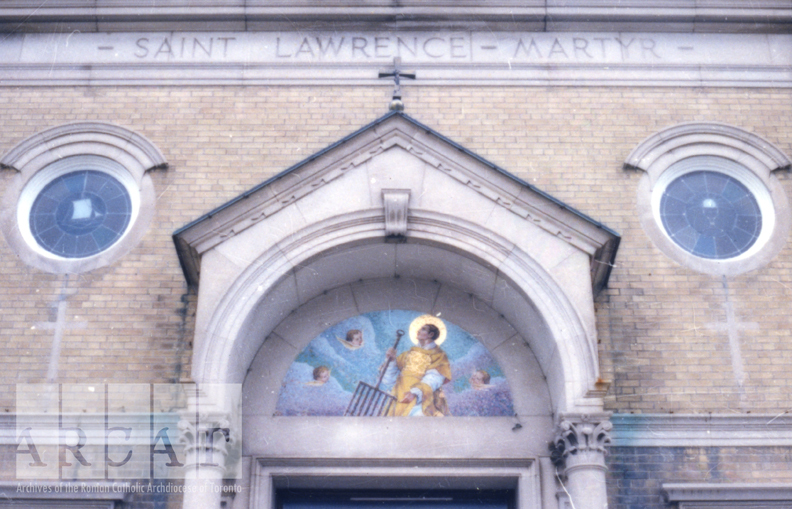 Front entrance of St. Lawrence Martyr Parish on Lawrence Avenue, Scarborough, 1991. The mosaic depicts the parish's patron with the instrument of his martyrdom, the gridiron. Today is the feast day of St. Lawrence, a well known martyr of the early Roman Church. St. Lawrence was one of the seven deacons of the city of Rome, under Pope Sixtus II, who were martyred when the Emperor Valerian ordered the persecution of Christians in 258 A.D. He was killed on August 10th of that year. If his hagiography is anything to go by, St. Lawrence was also one of the Church's earliest comedians (which is why we took liberties with the title of this post): as he was being roasted alive on a gridiron, he supposedly called out to his torturers something to the effect of, "Turn me over, I'm done on this side." He is now the patron saint of the barbeque and cooks. Celebrate St. Lawrence's feast day with a barbeque tonight! And if you go camping this month, say a little prayer over your campfire as you roast your hot dogs and marshmallows. 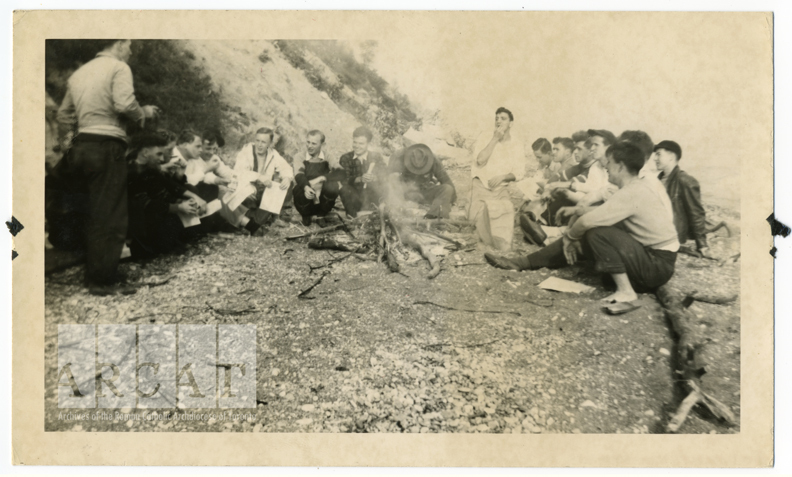 Seminarians from St. Augustine's Seminary sit around a campfire on the beach at the base of the Scarborough Bluffs, 1950s. O glorious Saint Lawrence, Martyr and Deacon, who, being subjected to the most bitter torments, didst not lose thy faith nor thy constancy in confessing Jesus Christ, obtain in like manner for us such an active and solid faith, that we shall never be ashamed to be true followers of Jesus Christ, and fervent Christians in word and in deed. Amen. There is one parish in the Archdiocese of Toronto dedicated to St. Lawrence Martyr, shown here in the late 1960s (photo by John Sexton for the Catholic Register). The parish was founded in 1959. 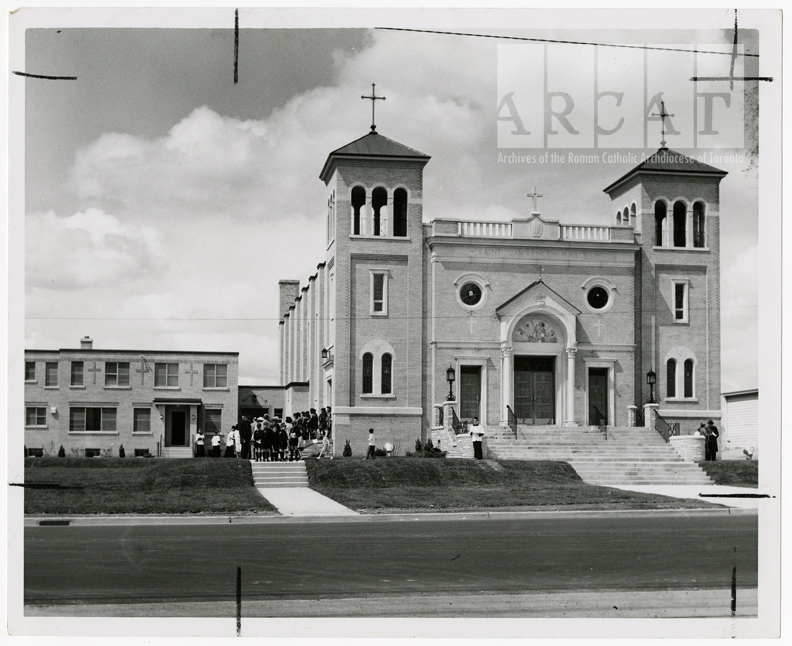 Construction of the church started in 1960 and the official blessing took place on May 21, 1961. The church was designed by architect James Haffa in the Romanesque style. St. Lawrence is also the patron saint of Rome. Of course, fires are no laughing matter and this has been a terrible summer for wildfires raging across the country, especially in British Columbia and Ontario. St. Lawrence is also the patron saint of firefighters. Take a moment on this feast day to pray for the safety of our firefighters and give thanks for their selfless fortitude.